Dock Tarn is a very pretty tarn situated on the moorland at 400 metres near the summit of Great Crag, midway between Watendlath, the Stonethwaite valley and Borrowdale. The small tarn, about 300 by 200 metres, has rocky headlands and bays and a tiny island with a few small Rowan trees growing on it. Watch out for the wildlife we saw two Goosanders. We turn left out of the car park and head forwards past the public toilets to the main road. We turn left then opposite the bus stop we turn right at the sign post for Watendlath 1½. After crossing the bridge we turn right and follow a narrow path between two walls with Stonethwaite Beck on our right. We pass through a gate and keep heading forwards and go through another gate. When we come to a sheep fold we start to bear left uphill. We go over a wall via a stile and keep heading forwards uphill through the trees. We cross over another stile and keep heading very steeply uphill. At the top we keep following the path by the side the stream until we arrive at Dock Tarn. We now keep following the path by the side of the tarn and when the path starts going downhill Watendlath comes into view. We keep heading downhill, going through a gate and over a stream in, until we arrive at Watendlath Tarn. 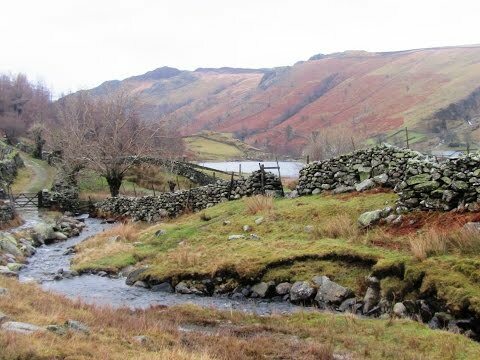 We walk by the side of the tarn to the end and turn left at the signpost for Rosthwaite. We now follow the track uphill. The path levels out and we go through a gate before we start heading downhill. We keep heading downhill to a sign post and turn right through the gate and still keep heading downhill following the path back to Rosthwaite which we can now see in front of us. This is a moderate to hard walk on distinct stony tracks with some very steep inclines and declines. From the A66 coming from the east take the A5271 for Keswick. At the junction turn right. At the traffic lights carry on forward. At the mini roundabout turn left then left again at the junction. At the roundabout go straight over then at the next roundabout turn right and follow this road passing Derwent Water then Grange on the right. Continue on to Rosthwaite and turn right at the car park sign. The car parks are on the right. There are public toilets just next to the car park and for refreshments there is the Royal Oak pub in Rosthwaite on the main road and the Flock-in Tearoom at Yew Tree Farm. There are also public toilets in Watendlath along with a car park, a cafe and a tearoom. Brings back memories of a soggy wild camp on the shoulder of Great Crag and locked tearooms at Watendlath village! This was the day my mate’s waterproof jacket failed. Good Herdwick stew at the Flock In was very welcome.